My mum's favourite flowers have always been Lilly of the Valley. The first time she saw them, I think, was when she went to Paris, France, in her early twenties. They don't grow in Portugal, where she comes from and lives, so they are very special, and exotic, to her. Everytime I see the first Lilly of the Valley delicate flowers shooting up in the late Swedish Spring, I always call her to tell her about it! When I found this fabulous floral fabric on Retrodepot I just knew I had to make something out of it for my mum. So I made this bag. 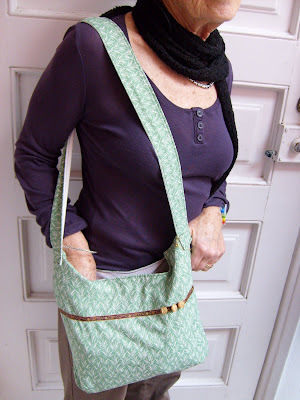 It is of course yet another size variation of the Charming Handbag, pattern by Amy Karol, from Bend the Rules Sewing. Only here I have exchanged the handle for a shoulder strap. This is the third size (original size here and XL here!) I Have used for this same pattern. It is definitely a perfect pattern to use in different sizes. The lining is a recycled old, but almost unused shirt that my partner had, literally, grown out of. It's a lovely thin, smooth cotton of very good quality! 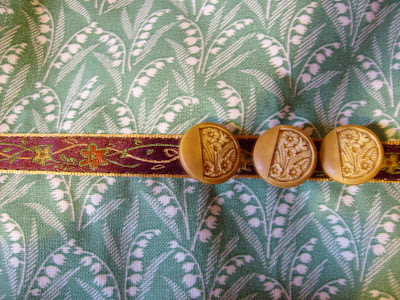 The three little buttons I stiched to the decorative ribbon on the outside were new, but they have a very old-fashioned, vintage look to them, which was what I really liked about them. And they went perfectly with the Lilly of the Valley fabric. A mala está muito gira! Tenho ouvido falar tanto desse livro que tenho que o comprar! Fabric, ribbon and botons make a perfect match. I love it! Thanks for the "Bend the rules" recomendation as well, since, you know, I'm trying to get good sewing books at the moment. Nice blog. This handbag looks awesome. 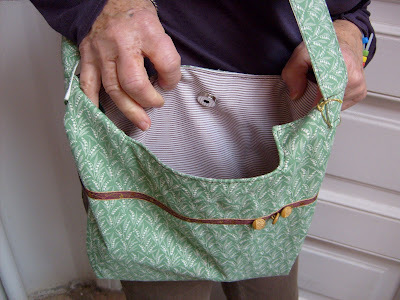 Fabric, ribbon and botons adds to the beauty of Handbag. Your blog looks perfect. Que bonita prenda para a tua mãe:) Esse tecido é muito bonito, acho que já o vi em outras cores, mas esse verde é interessante, boa semana! 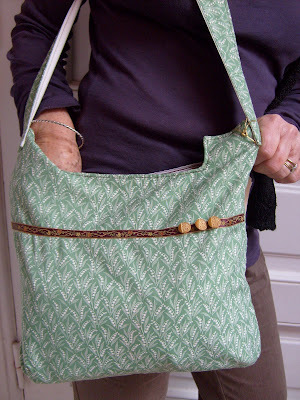 Nice bag and beautiful fabric. When you have them in your garden , you must be carefull because within some years you 'll have only lilly's of the valley's in your garden!! !